Google is all set to unveil second generation Pixel smartphones, mini connected speaker, a laptop, refreshed VR headset on October 4. Now Press images, Release Date of Google Pixel 2 and Pixel 2 XL has been leaked. Google Pixel 2 and Pixel 2 XL will be Manufactured by HTC and LG, respectively codenamed Walleye and Taimen running on Android 8 Oreo handsets. Google Pixel 2 to feature a 5-inch Full HD Display whereas Pixel 2 XL has a six-inch, QHD+ display in an 18:9 aspect ratio both Powered by Qualcomm Snapdragon 835 Processor.4GB of RAM, either 64GB or 128GB of storage, and 12-megapixel primary rear cameras, along with front-firing stereo speakers. Google Pixel 2 will cost $649 with 64GB of storage, and $749 for 128GB. 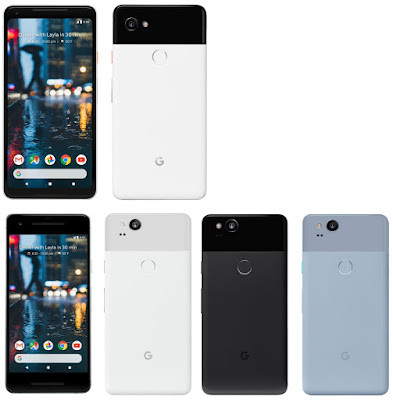 Pixel 2 will be available in Kinda Blue, Clearly White, and Just Black Pixel 2 XLwill available in Black & White.Google Pixel 2 XL will cost $849 with 64GB of storage, and $949 for 128GB.Pixel 2 available from October 19 and Pixel 2 XL from November 15.